Sprinkle with olive oil and seasoning then grill in the oven. Meanwhile boil Promin Low Protein Cous Cous, making sure it is not over boiled. Rinse with water to seperate small Cous Cous balls. 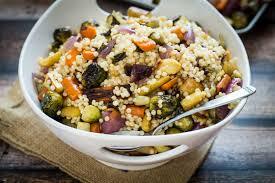 Combine Cous Cous with chargrilled vegetables. Add Blue Dragon sweet chilli sauce and chopped basil.